The Ann Arbor firefighters union is fighting back in response to Fire Chief Chuck Hubbard's plan to close down two of the city's five fire stations. Instead of closing stations, the union argues the city should be increasing staffing in the fire department to meet national standards. "The citizens of Ann Arbor should know that they are receiving sub-standard fire and emergency life-saving response coverage, and that our city managers would rather put the funds which could remedy the situation in the rainy day fund," reads a statement from the union released this week by President Matt Schroeder. The union is on a mission to get the Ann Arbor City Council to halt the shuttering of the two stations, closures Hubbard is considering given the reduced staffing in his department. The union is asking the council to instead increase staffing by 12 firefighters. According to the city's finance department, the cost of hiring a firefighter under the new labor agreement with the firefighters union is $79,599, inclusive of wages and benefits. The fire department has 76 firefighters right now, plus the chief and his administrative assistant. Hubbard told AnnArbor.com this week he recalls a time when the department had more than 120, but years of cutbacks have left the Ann Arbor Fire Department where it is now. To adequately staff five stations and meet national standards, the union claims it would take 18 firefighters per shift — versus the 15 staffed right now. "This would require 12 additional firefighters (four extra people for each of three shifts a day) in total to staff all shifts from current staffing, or 88 firefighters in total," the union states, citing the same figure Hubbard recently called his "magic number." Based on new contract terms, a staff of 88 firefighters — which the union claims would allow the city to meet national standards — would cost $955,000 more per year from current levels or $875,000 more than the 77 employees budgeted for the new fiscal year starting July 1. Tom Crawford, the city's chief financial officer, recently released a revised budget forecast, predicting general fund revenues will come in $900,000 higher than planned next fiscal year, while expenses are expected to be down by $700,000. Crawford is recommending the city sock away $1.4 million in its rainy day fund, but the firefighters union argues at least a portion of that should be used to hire firefighters. AnnArbor.com sat down with City Administrator Steve Powers and the fire chief this week to talk about the latest plans and the possibility of adding staffing. Powers is uncertain if the city will be able to increase staffing levels to 88 firefighters in the next budget, but he and Hubbard are confident the city will be moving forward with the change to a three-station fire department by July 1. Hubbard said he'll likely start making the transition and closing stations sometime in June, and it won't require council action. "I know the system I'm proposing is a good system — it's just hard to swallow. It's new, it's different," Hubbard said. "But this is by far a better system." Powers will be presenting his recommended city budget for 2012-13 in April, followed by council adoption in May. He said the lower cost of hiring a firefighter under the new labor contract makes it easier for the city to increase ranks if the council decides to go that route. "That will be a decision of council, but certainly it will allow for that choice to be made more affordably than the last couple of years," Powers said. Hubbard would like to increase his staff to 88 firefighters. But given the existing staffing levels, he believes concentrating the fire department's resources in three stations instead of five will better position the city to respond to fires. He acknowledges the city — while it might be better served— still will fail to meet national standards recommended by the National Fire Protection Association. That includes standards that suggest a fire department, at a minimum, should be able to get four firefighters to a fire within four minutes 90 percent of the time, and it should be able to get 15 firefighters — a "full alarm" assignment — to arrive within eight minutes 90 percent of the time. The city doesn't meet those standards now, nor will it under Hubbard's plan. Hubbard told the City Council recently he doesn't know of any fire department that meets all of the NFPA's standards. But the firefighters union said it contacted fire chiefs in Livonia, Dearborn and Sterling Heights and found all three cities meet the major components of the NFPA standards. AnnArbor.com was able to reach the chiefs of two of those cities — Livonia and Sterling Heights — to confirm the numbers. Livonia has 21 firefighters on duty per shift. It sends 17 firefighters to a fire. The city's fire chief, Shadd Whitehead, said the first engine arrives on scene in under 3.9 minutes on average, while the remainder of the fire response units arrive in less than eight minutes at least 90 percent of the time. He said Livonia fully complies with the NFPA standards. "I don't think we're the exception," Whitehead said. "In our business, no matter what fire department, it comes down to two things. You have to be there in a certain amount of time to make a difference, and you have to get there with enough resources." Dearborn staffs 25 firefighters per shift. It sends 14 to 17 firefighters to a fire, with the first engine arriving in under five minutes on average, and the remainder of the fire response units arriving on scene in under eight minutes at least 90 percent of the time. Sterling Heights uses four-person engine companies that arrive in four to five minutes on average, said Mike Deprez, the interim fire chief. He said the city has a minimum of 25 firefighters on duty per shift, which makes a difference in responding to fires. "We can guarantee four people on scene within five minutes 90 percent of the time," he said, factoring in one minute for turnout time — the time it takes for firefighters to throw on their gear — which is another NFPA standard in addition to the four-minute travel time. "Our average response time is closer to four minutes," he said. "We used to pride ourselves in a 3.5-minute response, but with traffic and road conditions it's closer to four minutes now." Deprez said his department usually puts 15 or 16 firefighters on the scene in under eight minutes, so it's meeting that standard as well. "Are they difficult to meet?" he said. "They do present some challenging scenarios certainly, but I wouldn't say they propose a hardship. Are they impossible? No, they're not. You certainly want to try to maintain that and meet the standard as much as possible." Sterling Heights has 97 firefighters plus another four clerical employees for a total of 101 employees in the department. He said the department has lost four fire inspectors and one clerical worker over the last three years but has maintained staffing otherwise. "Anytime you lose one member, it does change your operational plan," he said. "There's an equal and opposite reaction for every body you lose, and if you take a station out." 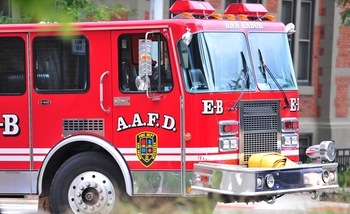 A recent study found it takes the Ann Arbor Fire Department 4.3 minutes on average just in travel time, plus another 1.8 minutes for dispatch time and 2.3 minutes for turnout time. Hubbard clarified that when he told the City Council he doesn't know of other departments meeting NFPA standards, he meant he doesn't know any that meet all of them. "The standard isn't just a four-minute response. There are a lot of variables to the standards," he said. "I don't know all of them, and different departments meet different parts of it. My point was no one meets them all. No one that I know of meets all the standards." Hubbard said he'd be curious to know how other departments are meeting the four-minute travel time standard. "I don't know who meets that. I question that," Hubbard said. "I'm not going to try to speak for other departments, but I'd have to see that in action." Faced with a $6.2 million deficit last August, Livonia officials asked their voters to approve a 1.7-mill public safety tax to avoid cuts to police and fire. "We're fortunate here in our city," Whitehead said. "The residents in the community spoke pretty loud and clear that public safety and the fire department is important to them and they passed a millage 3-to-1 to maintain the same level of service they had come to expect." 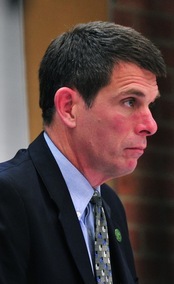 Powers said in the nearly seven months that he's been city administrator in Ann Arbor, there have not been any serious discussions of a public safety or fire millage. "As far as any policy direction, policy is established by council and council has not discussed it even in passing," Powers said. "We're in the second year of a two-year budget. I think significant policy changes, significant budgetary changes, would really flow into the 2014-2015 budget plan, which will start not too long after we're done with 2013." The union has argued fire fatalities are up since the city began making deep cuts to the fire department. Between 1992 and 2005, there were only three fire fatalities in 14 years in Ann Arbor, but there were 12 in the six years between 2006 and 2011. Hubbard denied there's a link between those deaths and staffing cuts. "There is no scientific way to account for that," he said. "Sometimes fires spike, sometimes they go down. Sometimes deaths spike, sometimes they go down. If you look at the fatalities that we've had, if you look into why they were, it has nothing to do with staffing." Hubbard said it's unfortunate the department has experienced some fatal situations, but none have been because of a lack of staff. For instance, he recalled one home blew up. "You can't help that," he said. "A fire station could be right across the street with 200 guys in there, it wouldn't have mattered." Sun, Apr 1, 2012 : 12:42 a.m.
A city income tax would add dollars to the budget. Fri, Mar 30, 2012 : 7:28 a.m.
Mr. Ranzini, how about getting UofM to take over and staff the North Campus station? Just tell UofM that after a certain date, the city fire department will no longer respond to service calls to UofM property unless a mutual service pact is in place. This would require UofM to staff and maintain a fire department. Sun, Apr 1, 2012 : 9:51 a.m.
snapshot, so you want to tax people who cannot vote? You are well on your way to becoming a politician! What city services do these &quot;ungrateful&quot; UofM employees use? Let's see, they can have their cars ticketed/towed for minor infractions, that is one service they benefit from. There are also a large number of renters who would see an increase in their income taxes with no corresponding decrease in their rent since the landlords will most likely pocket the savings. Way to go! Planning on running for Mayor? You're definitely qualified! Sun, Apr 1, 2012 : 12:41 a.m.
A city income tax would put money back in the budget by taxing U of M and other government employees who use city services but don't live in the city. City dwellers would break even with the savings on property taxes. Fri, Mar 30, 2012 : 7:17 a.m.
Our team, leading the city only knows how to waste money. They will never learn how to best prioritize issues, concepts and services. Thus, we are left with being led by a group that truly lacks any visionary leadership. Their track record speaks for itself. We deserve what we now have, as we keep voting them into office. I guess, we will never learn. Maybe we like the pain. Besides, it gives us something to complain about. Fri, Mar 30, 2012 : 4:21 a.m. The union wants more staffing(ie more compulsory dues)........ Go figure. Thu, Mar 29, 2012 : 11:27 p.m.
Razor - increasing union membership is standard operating procedure for every union...while I think there is plenty of blame to go around in terms of why there were cuts to FD, doesn't the union have a responsibility to understand when concessions are necessary? The FD union did not agree to the necessary concessions until the 11th hour when they were up against arbitration. Check the current FD contract online and then make your own determination as to whether citizen safety is their primary concern. What I see are a lot of rules designed to preserve jobs and keep things the same way that they were 100 years ago. If the FD union is so concerned with citizen safety why don't they come up with a different plan that doesn't automatically involve increasing staffing? Oh, that's right, it is much easier to just cry wolf and blame the City for everything. And before you start shouting about them giving back 3%, remember that other unions gave concessions as well...like healthcare changes years ago. Thu, Mar 29, 2012 : 8:30 p.m. I missed in the article where it said the union wanted more dues?? Please show me where it said that! I read the union is acking for more staffing to provide the best possible coverage for the citizens of Ann Arbor. I do not understand why everyone thinks it is the unions fault for the cuts to the F.D. Thu, Mar 29, 2012 : 6:07 p.m. I have to agree with other commenters that will siphon off money from the various &quot;buckets&quot; for public art, but not fully fund fire and police protection; it is absurd, and for certain Council members and the Mayor not to realize this is even more absurd. Of course the over priced piece of &quot;art&quot; in front of the new 'Justice Center' won't catch on fire, so I guess we are all good there. Thu, Mar 29, 2012 : 6:10 p.m.
Thu, Mar 29, 2012 : 5:38 p.m. The City of Grand Rapids just had ISO complete an assessment of their fire department (http://www.woodtv.com/dpp/news/local/grand_rapids/grfd-ranked-near-top-in-the-nation). They fared pretty well, improved their rating to a Class 2. Maybe taking a look at the ISO option would reveal some interesting statistical data that could be used to help make some informed decisions instead of the political rehtoric that is being played back and forth between all the various factions here in AA. Take an even broader look at what the City of Grand Rapids is doing city-wide to maintain and improve their overall economic well-being and living conditions. Thu, Mar 29, 2012 : 7:24 p.m.
ISO for Ann Arbor is currently at a 4....when stations are closed and the residents call for insurance rates for their home they will see an increase in costs due to the extend reponse time from downtown Ann Arbor, especially the westside of Ann Arbor....Good Luck folks. Thu, Mar 29, 2012 : 5:09 p.m.
INSURANCE SERVICES OFFICE. Somebody call ISO and have them evaluate the city's classification. Hello, is there anybody there?? Thu, Mar 29, 2012 : 4:33 p.m.
Hmm, after Craig's question the vociferous Mr. Ranzini has fallen silent. Thu, Mar 29, 2012 : 6:30 p.m.
@PhillyCheeseSteak: has it right! After my 7:30am meeting, I had a 9am monthly bank board meeting and a 12:30pm executive committee meeting, so am only now able to respond. Please see my detailed response above, thanks! Thu, Mar 29, 2012 : 5:18 p.m.
Maybe he had to get back to work? Thu, Mar 29, 2012 : 5:12 p.m.
cause craigs question is asking to pay more for something the city should already have enough funds for (and does, if they were to cut stupid expenditures) . . .
Thu, Mar 29, 2012 : 3:34 p.m. The city needs to prioritize their expenditures -- the art fund needs to go, DDA needs to go, and the Staffing of AAFD and AAPD needs to increase to bring them up to full capacity. In addition, re: &quot;the rainy day&quot; funds -- it definitely is raining, so let's get with it. Thu, Mar 29, 2012 : 2:39 p.m.
We need 'em, and I would be willing to pay for 'em. Thu, Mar 29, 2012 : 2:38 p.m. The fact that the city has six fire stations is not directly related to current NFPA guidelines. Nor is the placement of these stations. That has more to do with available land and historical population patterns. It is not coincidence if that corresponds to a four minute response time, the city built fire stations as it grew. Mr. Ranzini and Chief Hubbard have both ignored the fact that the edges of Ann Arbor do not drop off into the void. There are numerous fire stations which overlap with the coverage that AAFD provides. The most obvious one is in Pittsfield Township next to the Ann Arbor airport, which could cover a large area of the city - and does! For some it is a matter of pride, ego, self-sufficiency, or security that we do not count these neighboring departments in the plan, but that is unnecessary. The four-minute response is a *statistic* and just for the first unit. Certainly there will be several more stations responding within the five minutes after that, including the ones who own the turf. And once a truck is out, the neighboring stations must be alert to cover for them in case a random second fire occurs. The random second fire will never be covered in the same four-minute window unless the truck is already out, but that is not the point. The city needs to keep all stations open on the north side, there is no adjacent community to turn to, and they need to keep at least one station open in the south. Coverage of the south and southeast sides could more easily be shared with the neighboring urban communities where the road system already supports cooperation. Sat, Mar 31, 2012 : 10:39 a.m.
@Basic Bob: my wife and young son visited the Pittsfield Township fire station you mention above two week ago during a school trip and learned that the station only has a skeleton staff on site and relies on volunteer first responders to drive from wherever they are to the site of a fire or medical emergency. Until they staff up, Ann Arbor can't rely on much assistance from them beyond one firefighter showing up with a fire truck, and the staff on site was skeptical of their preparedness even to cover their own service territory in Pittsfield Township properly. On the other hand, I do agree with you and others that the units of government at all levels should look hard at efficiencies that can achieved by providing county-wide services, when that makes sense. It makes sense when costs can be lower and quality of service can be raised up by realizing &quot;economies of scale&quot;. Thu, Mar 29, 2012 : 10:15 p.m. Finally a decent post. Thanks Bob. I think there is way too much panic over fire staffing with little reason to do so. Every city department will want some of the surplus and all can make a valid case for it. Like road repair. Or bridges. The Stadium bridge should never have gotten into such disrepair and municipalities are supposed to be beefing up those funds so repairs/replacements can be made. Does not matter anyway if there is an &quot;art bucket&quot; or a &quot;greenbelt bucket&quot; the voters approve of this kind of thing or we would see turnover on council. Thu, Mar 29, 2012 : 5:55 p.m.
we can't close stations and expect another municipality to pick up our slack, that's not how it works. That other municipality has the same right to expect we will be able to help them out. In my personal opinion we could get more bang for our buck if all police and fire were combined at a county level. It would eliminate some white collar &quot;dead weight' and put more real first responders in trucks and cars. Thu, Mar 29, 2012 : 5:11 p.m. Basic, what about the westside? should residents count on Scio? Thu, Mar 29, 2012 : 4:28 p.m.
&quot;The city needs to keep all stations open on the north side, there is no adjacent community to turn to, and they need to keep at least one station open in the south. &quot; I guess you forgot about Ann Arbor Township which is to the North. Thu, Mar 29, 2012 : 1:02 p.m.
Last i checked, we have a tremendous amount of debt. How about paying it down. We've been doing just fine with the staff on hand. Perhaps fire fighters should respond to fire related calls only. &quot;Hubbard said it's unfortunate the department has experienced some fatal situations, but none have been because of a lack of staff.&quot; FIRE deaths. What about medical calls? Contrary to what they'd like us to believe, HVA can't cover everything. Brain cells start to die after 4 minutes without oxygen. Thu, Mar 29, 2012 : 7:18 p.m.
63Townie, you have to understand that Hubbard hated running medical runs while he was riding trucks for AAFD. Thu, Mar 29, 2012 : 12:43 p.m.
Rainy day fund, rainy day reserve, or emergency fund are terms used to describe a reserved amount of money to be used in times when regular income is disrupted or decreased in order for typical operations to continue. In the United States, the term is usually used to apply to the funds maintained to help deal with budget shortfalls in years where revenues do not match expenditures. This is critical to the operations of most cities which are not permitted to take on debt without a millage, meaning that services would have to be cut in the absence of reserve funds. It appears a rainy day has arrived in Ann Arbor! indeed. If understaffed fire and police departments isn't &quot;rainy day&quot; what is? Thu, Mar 29, 2012 : 12:34 p.m. There are departments that meet the standard. You just have to ask Chief. Thu, Mar 29, 2012 : 12:26 p.m.
Thu, Mar 29, 2012 : 12:25 p.m.
Livonia, Dearborn and Sterling Heights are all mentioned in the story. Looking at their populations and square miles and economic I don't see why we can't have 21-25 firefighters per shift like they do. Thu, Mar 29, 2012 : 12:17 p.m. It's alright. I am comfortable. If my house is on fire or I need emergency medical help, I will most likely not receive it any faster than a resident of Detroit. But, again, it's ok. Afterall, I pay just 5 figures in property taxes and live in a city that prides itself on spending for the arts while basic public services are cut. All in the name of global warming. Thank you Mayor Hieftje and all of your posse on and off council. And thank you most to all of the Ann Arbor voters who repeatedly put this spendthrift joker in charge of the public trust. Thank you. Thu, Mar 29, 2012 : 12:08 p.m.
Mr. Ranzini, I read your very impassioned responses to all fire related stories. In this story i see the following.... &quot;Faced with a $6.2 million deficit last August, Livonia officials asked their voters to approve a 1.7-mill public safety tax to avoid cuts to police and fire.&quot; &quot;Powers said in the nearly seven months that he's been city administrator in Ann Arbor, there have not been any serious discussions of a public safety or fire millage.&quot; My open question to you is, would you favor a public safety millage in our city? Thu, Mar 29, 2012 : 9:24 p.m.
@Craig Lounsbury: the initial draft of Plan B used the last known figure for the cost per firefighter which used to be about $100,000 per person per year in wages and benefits. The new figure uses the actual costs under the new contract between the city and the firefighters union, which as noted above is &quot;$79,599, inclusive of wages and benefits.&quot; It also wasn't clear if 12 or 11 additional firefighters were needed above the budgeted amount and now it is clear, that 77 are budgeted and 88 required, so 11 more are needed. The cost of Plan B is actually $325,000 less than my original estimate versus what is now in the current fiscal year 2013 budget. I had originally estimated an additional cost of 12 x $100,000 each or $1.2 million and we now have the actual number which is 11 x $79,599 or $875,589, which Ryan Stanton, the fire fighters union and I have rounded to $875,000. Thu, Mar 29, 2012 : 7:07 p.m.
Mr. Ranzini, On March 17 your plan was.... A. $1.4 million added to the rainy day fund with 76 firefighters operating from three fire stations who can get to 72 percent of all fires with four firefighters in four minutes, OR B. $200,000 added to the rainy day fund with 88 firefighters operating from five fire stations able to get to 90 percent of all fires with four firefighters in four minutes. today your plan is... A. $1.4 million added to the rainy day fund with 76 firefighters operating from three fire stations who can get to 72 percent of all fires with four firefighters in four minutes, and 53% of all fires with eight firefighters in eight minutes, OR B. $525,000 added to the rainy day fund with 88 firefighters operating from five fire stations able to get to 90 percent of all fires with four firefighters in four minutes and 90% of all fires with eight firefighters in eight minutes. I see a $325,000 discrepancy between the two plan B's. What happened since March 17th? Thu, Mar 29, 2012 : 6:21 p.m.
Thu, Mar 29, 2012 : 3:13 p.m. I would not favor such a millage for one simple reason: city council needs to prioritize current spending to address the primary role of city government -- safety of city residents -- and cutting out the waste. Once that i done then we can see what additional resources are required to meet public safety requirements. A special millage now just allows city council to pursue its old inefficient practices, and that is unacceptable. Thu, Mar 29, 2012 : 1:46 p.m.
since i asked the question, I'll give my answer. I would support a public safety millage in principle too. But I would also like to see some things go away. Things like the art bucket and the green belt bucket. Realizing these things can't be interconnected on a ballot I would likely still vote yes on a public safety millage. Thu, Mar 29, 2012 : 12:51 p.m. I would as well. And put that silly greenbelt back up for a vote while they're at it. Thu, Mar 29, 2012 : 12:14 p.m. I would. I would also vote for Mr. Ranizini if he runs for mayor. Thu, Mar 29, 2012 : 11:40 a.m.
&quot;and it won't require council action&quot; No, just a huge helping of council and mayoral inaction. They are staying as far away from this as they can, and the administrator is doing his duty to provide &quot;political cover&quot;. Pretty disgusting. They are playing games with our lives, people. Thu, Mar 29, 2012 : 11:24 a.m. This article notes that the city commissioned a report about our fire department from fire safety consultants, ICMA, and in that study the average response times were 4.3 minutes. But staffing levels have continued to fall and currently, the fire department has 76 staff, 18 fewer than when ICMA did the research for its report. What was inadequate then, is extremely unsafe now. Not surprisingly, the city's report concluded that the staffing levels were inadequate and that the city was not meeting national fire safety standards. So their solution is to cut fire stations and not increase staff levels! Thu, Mar 29, 2012 : 11:19 a.m.
Fri, Mar 30, 2012 : 12:15 p.m.
4 minutes / 5 minutes whats a minute between friends? Thu, Mar 29, 2012 : 11:09 a.m.
Huron Valley Ambulance which provides all ambulance services in Ann Arbor aims to respond to emergency medical calls such as heart attacks in 10 minutes. HVA usually arrives after the AA Fire Department because the fire department is striving (but currently failing over 60% of the time) to arrive in 5 minutes (4 minutes travel response time plus 1 minute for &quot;turn out&quot; time before departing the fire house). Our fire fighters are all highly trained on emergency first aid and can save lives when a quicker response saves lives. Firefighters often are driving the ambulance to the hospital while EMTs are trying to stabilize a patient in the back. HVA personnel often need lifting assistance in getting a patient to a gurney. The myth that HVA can do it all is just a myth. Do you want someone to arrive to a medical emergency in your family on average five minutes later because the rainy day fund &quot;has to be&quot; $875,000 larger in fiscal year 2013? Thu, Mar 29, 2012 : 7:41 p.m.
Thu, Mar 29, 2012 : 7:15 p.m.
Huron Valley Ambulance has spread themselves out over 8 counties in southeastern Michigan. Thu, Mar 29, 2012 : 6:48 p.m.
@Craig Lounsbury: the executive director of HVA stated in a recent meeting covered in AnnArbor.com that their response time goal in Ann Arbor is 10 minutes and that was what they were accomplishing. They do serve a wider service area than just Ann Arbor so perhaps that explains the difference between the two statistics? Thu, Mar 29, 2012 : 11:59 a.m.
&quot;Firefighters often are driving the ambulance to the hospital&quot; often?... or occasionally? Thu, Mar 29, 2012 : 11:56 a.m.
HVA's average response time in urban areas was 6 minutes and 18 seconds in 2011. Thu, Mar 29, 2012 : 11:01 a.m. The scientific national standard for best practices in fire safety includes the ability to get four firefighters to 90% of all fires within four minutes and 15 firefighters to 90% of all fires within eight minutes. It comes down to this with the 2013 fiscal year budget, do you want: A. $1.4 million added to the rainy day fund with 76 firefighters operating from three fire stations who can get to 72 percent of all fires with four firefighters in four minutes, and 53% of all fires with eight firefighters in eight minutes, OR B. $525,000 added to the rainy day fund with 88 firefighters operating from five fire stations able to get to 90 percent of all fires with four firefighters in four minutes and 90% of all fires with eight firefighters in eight minutes. The chief says that he really needs B, but the Mayor, City Manager and Joan Lowenstein want to give us A. I vote for &quot;Plan B&quot;!! So, so very true! Until the citizens of Ann Arbor speak up and demand the proper fire protection, police protection, proper street maintence and all other core services, nothing will change! It solely lies in the citizens hands!! Thu, Mar 29, 2012 : 4:22 p.m.
Thu, Mar 29, 2012 : 4:20 p.m. I like plan B. To be totally fare even with plan B they won't come close to the national standards. They are running 5 stations today and based on the facts presented have a response time &lt;4 minutes. Adding people won't shorten the travel distance. Thu, Mar 29, 2012 : 3:29 p.m.
Vote for plan B as per Hubbard -- of course, the major, city manager, and Ms. Lowenstein would not approve of it. I wonder if they would be more included to vote for Plan B if it were their house or loved one who needed immediate attention.